Click on the links below to see the Capitol Visitor Center suite of brochures. For a complete list of translated brochures, please visit our International Translations page. This brochure provides a wealth of information in order to prepare you for a visit to the U.S. Capitol. It includes information about tours of the Capitol, visitor amenities, location, hours of operation, and security. The same information can also be found throughout this Website. Constantino Brumidi (1805 – 1880) is known for the murals he painted in the U.S. Capitol over a 25-year period. This brochure provides detailed information and photographs on Brumidi and his achievements, including his most ambitious work, The Apotheosis of Washington, in the Rotunda eye of the Capitol dome. A commemorative marker acknowledging the role that enslaved laborers played in the construction of the United States Capitol is located in Emancipation Hall in the U.S. Capitol Visitor Center. The United States Capitol is the most widely recognized symbol of democratic government in the world and has housed Congress since 1800. This brochure provides in-depth information about the Capitol and Congress. The Statue of Freedom has stood atop the United States Capitol Dome since 1863. Hoisted into place while the country was divided by the Civil War, the bronze statue designed and sculpted by American sculptor Thomas Crawford was created as the crowning feature of the building’s new cast-iron Dome. This guide and map highlight features of the U.S. Capitol Grounds. Begin your exploration anywhere on the map. As you follow walkways, enjoy the many scenic views of the Capitol and its surrounding landscape. 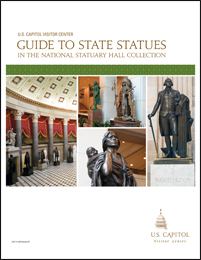 This guide to the National Statuary Hall Collection of State Statues describes and illustrates and provides locations for the 100 statues at the U.S. Capitol donated by the 50 states to honor people notable in their history.